CHIPOTLE IS COMING TO PROVIDENCE!!!! You can imagine my excitement while reading the Brown Daily Herald this morning in class…My stomach started growling right then. 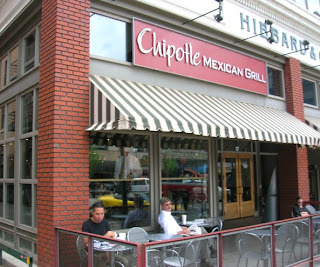 Chipotle is planning to build two new locations – one in Warwick, and one in Providence (hopefully on Thayer St?!). Now, if you’ve never had Chipotle before, you’re in for a treat…humongous, 5 pound, 1,000+ calorie burritos – heaven in a tortilla. The Food Square? I think not! The square has melty, crunchy, spicy, and grilled. Seriously? Even McDonald’s is more concerned about the health of their customers at this point! Promoting a “meal between dinner and breakfast” is just wrong. Check out Taco Bell’s Nutrition Guide here. My professional opinion on the matter? 1) No, a burrito is not a sandwich. What’s funnier about this article is that I used to work at that Panera. What people came up with these?! Fried Coca-Cola: Coke-battered cake nuggets, deep fried. The Krispy Kreme Burger: a bacon cheeseburger sandwiched between 2 Krispy Kreme donuts.